Villa Cofresi Hotel, Rincon, Puerto Rico - Lowest Rate Guaranteed! 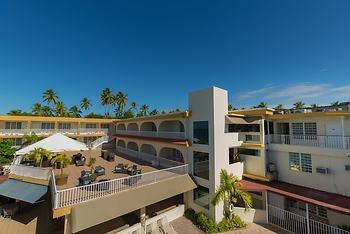 Located in Rincon, Villa Cofresi Hotel is a 4-minute drive from Rincon Central Plaza and 10 minutes from Domes Beach. This beach hotel is 3.6 mi (5.8 km) from Punta Higuero Light and 4.2 mi (6.7 km) from Sandy Beach. Everybody on the staff is very friendly and helpful. The location of the hotel and it’s layout are superb. The town of Rincon has many restaurants that are good and is a friendly sunny place. Rincon is a good base to drive around to interesting sites on the west side of Puerto Rico: the radio telescope at Arecibo, the Guanica dry forest, the archaeological site at Tibes, the Camuy caves complex, The Sandra coffee estate, The town of San German , and the coffee/sugar estate north of Ponce, and the bio luminescent bay down towards Cabo Rojo. In short there are lots of things to do around Rincon. It’s too bad that the hotels beach was diminished by hurricane Maria, but there is enough they are remaining to allow you to lie in the sun if you care to. Room temperature was too cold. The restaurant was amazing; food and drinks were great and the prize was truly surprising- a great deal! The room was very comfortable, great furniture and extremely spacious- we can’t wait to return. Checkout staff was not as courteous as the ones that checked us in. I inquired about future reservations and they did not seem eager to help me with a potential future stay when I asked about rooms and prices during th summer time. Very friendly and helpful staff. great location to experience the west of the island. First night with out aire conditions . Our room was very nice and clean. The staff was very friendly and accommodating and the location and scenery was exquisite! The free breakfast was lacking. In my opinion, some other healthier options should have been offered. Local fruits and juices, yogurt and granola would be nice. Me gustó mucho el trato del personal y cercanía de la playa y el servicio del desayuno continental.